For several decades before Pontiac's Rebellion, Great Britain and France were at war in Europe. Some of the fighting happened within the colonies and was known as the French and Indian War. The last conflict between Great Britain and France was called the Seven Years War. The result was that the French gave "New France" in America to the British. Much of the fighting in the colonies ended after British General Jeffrey Amherst captured French Montreal in 1760. The British moved to occupy the forts in the Ohio Territory and Great Lakes regions before the Treaty of Paris was signed in 1763. Where the French had looked at the assorted tribes as allies and treated them with respect, the British treated them as a conquered people. This angered many of the tribes in the areas. The tribes in the area were unorganized. They were considered tribes because of language and ethnic similarities rather than a political unit. No chief spoke for an entire tribe and no one tribe acted alone. There were essentially three groups of Natives in the area newly added to the British Empire. The first group was the tribes of the Great Lakes. They were made up of Ottawas, Ojibways, Powatomis and Hurons. They had lived, traded and intermarried with the French. They were extremely alarmed when the French lost the land to the British. They were even more dismayed when a British garrison moved into Fort Detroit in 1760. Local natives cautioned the British at Fort Detroit that "this land was given by God to the Indians." The second group was the tribes of Illinois Country. They included the tribes of Miamis, Weas, Kickapoos, Mascoutens and Piankashaws. These tribes had also had a good report with the French. The British were unable to project their military power to them as they were on the farthest edge of the territory. They were the last to come to terms with the British. The third group was the tribes of Ohio Country. These tribes were the Delawares, Shawnees, Wyandots and Mingoes. These tribes had already moved west to escape British, French and Iroquois settlements. They had no great attachment to the French, but had fought alongside them as a means to thwart the British expansion. After the French and Indian War, these tribes had made a separate peace with the British with the understanding that the British would leave Ohio Country. However, after the French departed, the British began to strengthen the forts in the area. So these tribes went back to war to drive out the British. Outside of these tribes was the Iroquois Confederacy. Most of these tribes did not participate in this war because of the Covenant Chain they had with the British. However, the westernmost tribe, the Senaca, had become disenchanted with the alliance and had begun to send out war messages to the Ohio and Great Lakes tribes as early as 1760. When war began in 1763, the Seneca did not hesitate to join in. General Amherst, the British commander-in-chief, believed that with France out of the picture, the natives would have no choice but to accept British authority over themselves as well as the fur trade. He also believed that the natives would offer no serious resistance. Of the 8000 troops under his command, only 500 served in the area. Amherst and some of the officers of various forts held the natives in contempt and the chiefs repeatedly complained that they were treated no better than slaves or dogs. More resentment occured when Amherst chose to cut back on the "gifts" given to the natives. The French had given gifts of clothing, weapons, knives, and ammunition to the chiefs who then passed it down to others in their tribe. This made the chief seem more important in the eyes of his people and helped supply his people with items they needed. Amherst, however, considered these bribes and in Feb 1761 decided not to give any more. The natives looked upon this decision as an insult and that Amherst considered them a conquered people not allies. Amherst also began to restrict the amount of gun powder and ammunition that could be sold to the natives. He feared another uprising similar to the Anglo-Cherokee War where the Cherokee had turned on their British Allies. The British had defeated the Cherokee only because the Cherokee were low on ammunition and gun powder. Sir William Johnson, Superintendent of the Indian Department warned Amherst that he was making a mistake, but he would not listen. Meanwhile, resentment grew. Limiting powder and ammunition made it more difficult for the warriors to feed their families and continued with the fur trade, now that they had switched away from their traditional methods to firearms. Land was also an issue, but not an issue as most suspect. The Ohio Country tribes had been displaced in the east. But the Illinois Country and Great Lakes Regional tribes were not in immediate danger of being displaced. Their fear was the presence, attitudes and policies of the British Army which threatened their way of life. A religious awakening had also swept through the native populations in the 1760s. This fed discontent as their was also food shortages and epidemics that swept through too. The most influential man, Neolin, also known as the Delaware Prophet, counselled the natives to stay away from trade goods, alcohol and weapons of the whites. Merging Christianity with traditional religious beliefs, he encouraged the tribes to stay away from whites, stating that the Master of Life was displeased with them for taking up the white's bad habits and that the British way of life posed a threat to their existence. In 1761, rumors reached the British that the Native Americans were planning to attack. The Seneca's in Ohio Country (Mingoes) circulated war belts made of wampum trying to form a confederacy to push the British out. War belts originating near Detroit and in Illinois were also circulating. However, the tribes did not unify and in Jun 1761, tribes near Detroit informed the British of the plot. In Sep 1761, William Johnson held a meeting with tribes in Detroit and a tenuous peace was arranged. However, once the Treaty of Paris was signed which formally turned the land over from the French to the British and that the French would not be returning, war erupted. On 27 Apr 1763, Chief Pontiac spoke at a council of Ottawa, Ojibway, Powatomie, and Hurons. He encouraged attacking using the teachings of Neolin to inspire. Pontiac's plan was to seize Fort Detroit and drive out the British. On 7 May, Pontiac, with about 300 warriors, entered the fort with weapons hidden under blankets. It was supposed to be a surprise attack, but the 120 soldiers at the fort were armed too, as the fort commander, Henry Gladwin, had apparently been inform of Pontiac's plan. Pontiac withdrew. Two days later, he and his men laid seige to Fort Detroit. Killing or capturing all English settlers and soldiers outside the fort. One soldier was ritually cannibalized, as was the practice among some of the Great Lakes tribes. French settlers were left alone. On 16 May, Fort Sandusky was captured. Fort Sandusky was a small blockhouse on the shore of Lake Erie. A group of Wyandots, on the pretext of holding a council, entered the fort, seized the commander, killed the other 15 soldiers and any British traders there, and burned the fort to the ground, as they had warned Amherst they would do. The traders killed were the first of about 100 to die during this war. Fort St Joseph, at present-day Niles, Michigan, fell on 25 May. The commander was captured, just as Fort Sandusky, by a group of Powatomie's, and the fiften man garrison was killed. Fort Miami, present-day Fort Wayne, Indiana, fell on 27 May. The commander was lured out by his Native mistress and shot dead by Miami warriors. The nine-man garrison surrendered when it was surrounded. A supply convoy commanded by Lieutenant Abraham Cuyler on it's way to Fort Detroit, on 28 May stopped at Point Pelee. Not knowing the situation at the fort, he did not take any extra security precautions and about 200 warriors attacked them. Killing or capturing 61 of the 96 men under Cuyler, they took the captives to Detroit, where they were mutilated, tortured and their bodies thrown in the river which ran by the fort, undermining the morale of those holding the fort. The remaining survivors of Cuyler's men made their way to Fort Sandusky, only to find it destroyed. They then returned to Fort Niagara. On 1 Jun, in Illinois Country, Fort Ouiatenon, present-day Lafayette, Indiana, was taken by Weas, Kickapoos and Mascoutens. They lured out a detachment ostensibly for a council and captured them. The entire garrison was captured without bloodshed and the captives were not killed. The natives around this fort were friendly with the British. They told them that they were obliged to attack the fort by other tribes. The largest fort to fall, Fort Michilimackinac, present-day Mackinaw, Michigan, was taken 2 Jun. A group of local Ojibways staged a game of stick ball (forerunner to lacrosse) against a group of visiting Sauk. The soldiers came out to watch, as they had previously done. The ball was hit through the open gate of the fort. The warriors rushed in and were handed weapons smuggled in by Native women. Fifteen of the 35-man garrison were killed outright. Five more were tortured later. On 16 Jun, Seneca warriors attacked and overran Fort Verango, present-day Franklin, Pennsylvania, in Ohio Country. They killed the entire twelve-man garrison, except for the commander. He was made to write down the grievances of the Senecas and then he was burned at the stake. Two days later, those same warriors took Fort LeBoeuf, present-day Waterford, Pennsylvania. Most of the twelve-man garrison escaped to Fort Pitt. The final fort to fall, Fort Presque Isle, present-day Erie, Pennsylvania, was surrounded during the night of 19 Jun by 250 Ottawa, Ojibway, Seneca and Wyandot warriors. The garrison of 30-60 men held out for two days before surrendering on the condition they would be allowed to return to Fort Pitt. Most were killed when they left the fort. On 31 Jul, Captain James Dalyell and Major Robert Rogers led about 250 British troops to make a surprise attack on Pontiac's camp near Parent's Creek. However, Pontiac had about 300 warriors armed and ready, possibly alerted by a French civilian. Pontiac's warriors killed 20 and wounded 34 more, and the creek ran red with blood, giving the battle the name of Bloody Run. Even though the British were defeated, it was not a demoralising victory, that might have made them retreat and Pontiac began to loose face among the natives due to the stalemate at the fort. Dalyell was one of those killed. 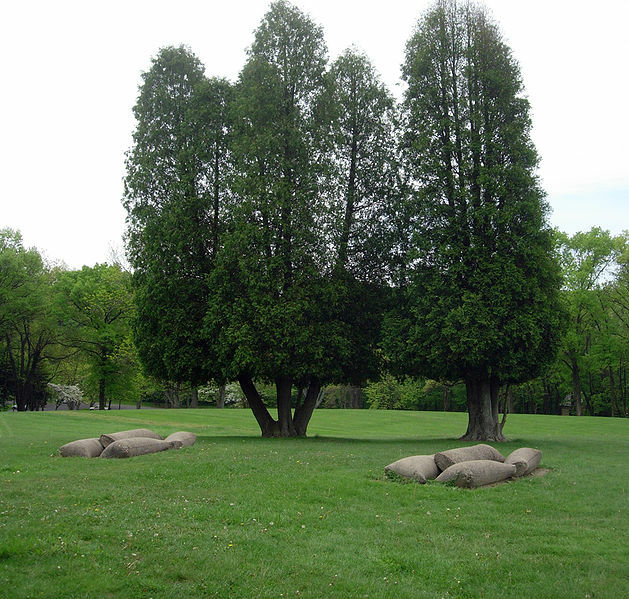 After learning of his death, Amherst put a bounty of 200 pounds on anyone who could bring him Pontiac's scalp. Many settlers in the area had fled to Fort Pitt, present-day Pittsburgh, Pennsylvania, with the outbreak of the war. The commander of Fort Pitt, Swiss-born Simeon Ecuyer, complained to his superior that he feared disease. Approximately 550 settlers had gone to the fort for refuge and small pox was among them. On 22 Jun 1763, primarily Delawares attacked Fort Pitt. However, the fort was too strong to be taken, so they kept the fort under seige. Delaware and Shawnee war parties meanwhile, raided deep into Pennsylvania. To smaller forts linked to Fort Pitt, Fort Bedford and Fort Ligonier, were fired upon but not taken. During a parley in the seige on 24 Jun, blankets which had been exposed to smallpox were given to the Natives in the hopes of given them the dreaded disease. However, because the Natives had already been exposed to small pox and had been dealing with small pox, history has been unable to determine whether their "blanket trick" worked. The seige at Fort Pitt did not let up until 1 Aug when the Natives moved to intercept 500 British troops under Henry Bouquet marching from Carlisle, Pennsylvania to Fort Pitt. The actual battle site was Edge Hill. The forces under Colonel Bouquet included the 42nd Highlanders, the 60th Royal Americans, and the 77th Highlanders. At Fort Bedford, 30 frontiersman signed on as scouts. At Fort Ligonier, Bouquet lightened the load, leaving behind wagons, artillery and supply wagon. Native scouts watched and reported the march to those who were holding Fort Pitt under seige. When Bouquet's forces reached Edge Hill, just east of Bushy Run, they were ambushed 5 Aug 1763. Bouquet's forces held for the first day. With darkness, the battle abated. Bouquet used flour sacks to create a redoubt. Wounded were put in the center of the redoubt. On 6 Aug, as the sun began to rise, the Natives struck again. Bouquet's strategy was to draw the warriors in and surround them. Once surrounded, many were fired at close range or attacked with bayonets. The British were able to successfully move on to Bushy Run where water was available and from there, to relieve Fort Pitt. 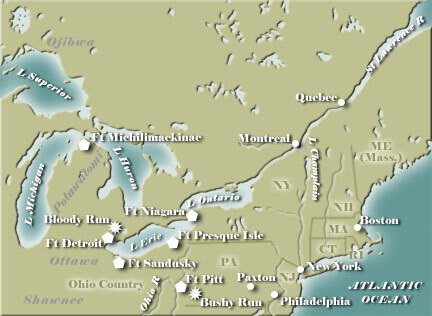 Although the British suffered heavy losses, they arrived at Fort Pitt 20 Aug.
On 14 Sep 1763, 300 to 500 Ottawas, Ojibways and Senecas attacked a supply train moving from Fort Schlosser to Fort Niagara along the Niagara portage route. They were attacked in an area referred to as Devil's Hole because of the steep terrain. The teamsters, led by Master Porter John Stedman, were attacked. Many of the animals stampeded or were driven into the ravine. Only three of the twenty-four teamsters made it to Fort Schlosser for aid. Stedman was one of the three. Hearing the fighting, two companies of the British 80th Regiment of Light Armed Foot led by George Campbell and William Fraser rushed to assist the wagons. They had been camped at Lewiston en route from Fort Grey. They were ambushed about a mile from the wagons and were also cut off from retreat. At least 80 soldiers were killed. Major John Wilkins attempted to respond with reinforcements from Fort Schlosser, but returned to the fort fearing another ambush. Several days later, they returned to find that all of victims had either been scalped or thrown in the ravine. Pontiac decided the seige of Fort Detroit was futile and that those he was expecting to help would not on 31 Oct 1763, when he withdrew to the Maumee River. He continued to rally resistance against the British, but did not take up arms against them further. Meanwhile, the violence had caused mistrust by the settlers in Pennsylvania. Concerned that the military was not doing enough to protect them, the Paxton boys, as they were called because the originated near Paxton, attacked a group of Susquehannas in Conestoga, Pennsylvania on 14 Dec 1763. Six were killed immediately and the remaining fourteen were placed in protective custody in Lancaster. On 27 Dec the Paxton boys broke into the jail and murdered them as well. Pennsylvania Governor John Penn issued bounties for the arrest of the murderers, but none were ever identified. The Paxton boys then decided to cleanse eastern Pennsylvania of any Natives. Fear caused many of the tribes in eastern Pennsylvania to flee to Philadelphia. In Jan 1764, when the Paxton boys arrived in Philadelphia, they were detoured from their goal by the presence of British troops and Philadelphia militia. Benjamin Franklin helped to negotiate with the Paxton boys and put an end to the immediate violence. Raids on frontier settlements during the spring and summer of 1764 escalated. On 26 May, near Fort Cumberland, Maryland, fifteen settlers working in a field were killed. On 14 Jun, thirteen colonists were killed and their homes burned near Fort Loudoun, Pennsylvania. Four Delaware warriors captured, killed and scalped a school teacher and ten children in Franklin County, Pennsylvania. This led the Pennsylvania Assembly with approval from Governor Penn to reintroduce scalp bounties for any Native American, including women, above the age of ten. Amherst was recalled in Aug 1763 and replaced by Major General Thomas Gage. Gage, using Amherst's strategy, sent two expeditions west to crush the rebellion, rescue British captives and arrest Natives responsible. In all essence, because his plan was to punish rather than end the conflict, this dragged it on longer. From Jul to Aug 1764, Johnson met with the Iroquois at Fort Niagara. His purpose was to bring the Seneca back into the Covenant Chain and remove them as a threat. The Seneca's were forced to cede to the British (an ultimately to the United States) the Niagara Portage. Johnson attempted to convince the Iroquois to attack the Delaware and Shawnee tribes, but their only contribution was to attack some abandoned villages of the Delaware and Shawnee in the Susquehanna Valley. Once the area around Fort Niagara was secured, Gage launched two expeditions. The first expedition was led by Colonel John Bradstreet. He was to lead 1200 soldiers and a contingent of Native allies from Fort Schlosser, across Lake Erie and reinforce Fort Detroit. Once Fort Detroit was secured, he was to travel into Ohio. The second expedition was led by Colonel Bouquet. He was to lead 1150 soldiers from Fort Pitt and form a second front in Ohio Country. Bradstreet, left Fort Schlosser in Aug 1764. Bradstreet did not believe that he had a large enough force to defeat Natives, so when strong winds on Lake Erie forced him to stop at Fort Presque Isle, he overstepped his authority and decided to negotiate a peace treaty with Guyasata, the influential chief of the Seneca/Mingo tribe. Bradstreet agreed to halt Bouquet's expedition. When they learned of Bradstreet's negotiations, Gage, Johnson and Bouquet were outraged by it. Gage refused to honor Bradstreet's treaty, believing he must have been duped into it. When the Natives did not show up for the next scheduled meeting in September with prisoners, it appears Gage may have been correct. Bradstreet continued westward to Fort Detroit, arriving 26 Aug 1764. He once again attempted to negotiate a peace treaty and overstepped his authority. Bradstreet attempted to discredit Pontiac to the other chiefs at the meeting. Pontiac was not present, but had sent a peace belt. Bradstreet chopped it up in front of them, insulting them. Bradstreet claimed that the Natives had accepted British sovereignty of them, although Johnson believed that it had not been fully explained to them. Bouquet left Fort Pitt 3 Oct 1764, after mustering the militia. He travelled down the Muskingum River in Ohio Country within striking distance of several villages. The local tribes were effectively isolated by the treaties at Fort Detroit and Fort Niagara and except for small pockets, were willing to agree to peace. In a council which began 17 Oct, Bouquet demanded that all British captives be returned, including those not yet returned from the French and Indian War. More than 200 captives were handed over, including many who had been adopted by Native families. Because not all of the captives were present, hostages were taken ensuring that those yet to be returned would be returned. The Ohio Natives agreed to attend a formal peace council with William Johnson in Jul 1765. The military conflict all but ended in 1764 with the expeditions. However, in Illinois Country, near Fort de Chartres, Natives were still ready to go on the war path to keep the British out. Particularly since the British had not yet taken possession of the fort. This pocket of resistance was led by Charlot Kaske' a Shawnee warchief. His zealousness surpassed that of Pontiac. Pontiac was more subdued, particularly after the treaty with the Ohio Natives. Kaske' travelled to New Orleans hoping the French would aid the resistance. William Johnson's deputy, George Croghan, travelled to Illinois Country to meet with Pontiac in Jul 1765. Although he was wounded when he was attacked by Kickapoo and Mascoutens, he did managed to meet and negotiate with Pontiac. Kaske' wanted to burn Croghan at the stake, but Pontiac urged caution and agreed to travel to New York to meet the following year. Pontiac signed a formal treaty 25 Jul 1766 at Fort Ontario with William Johnson. No lands were exchanged, no prisoners returned, no hostages taken. It was merely an acknowledgement of the current situation. While many consider that the Natives lost this war, in essence, they did not. The British could not entirely beat them and remove them. On 7 Oct 1763, in an effort to reorganize to colonies and incorporate the new lands gained through the Treaty of Paris, the Crown issued the Royal Proclamation of 1763, which did not allow the colonists west of the Appalachian mountains. This created an enormous area for the tribes to engage in their routines of caring for their families. Many of the settlers protested. The British did not think that the Natives could live in close proximity to the Europeans. This proclamation has come to be considered the Natives' Bill of Rights. The total loss of life in this conflict is unknown. Estimates of the number of soldiers who died is believed to be about 400. Another fifty plus may have been captured and then tortured. The number of settlers who died is estimated at least 2000. At least 4000 settlers in Virginia and Pennsylvania were forced to flee their homes. It is estimated that about 200 warriors were killed. However, that number could be higher if the germ warfare attempted at Fort Pitt was in any way successful. © 2010 Jeanne Hicks Warning: The unauthorized reproduction or distribution of this copyrighted work is illegal. Criminal copyright infringement, including infringement without monetary gain, is investigated by the FBI and is punishable by up to 5 years in federal prison and a fine of $250,000.